Welcome to the Community portal! 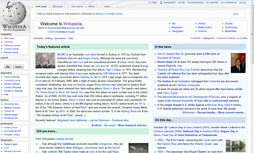 This page provides a listing of current collaborations, tasks, and news about English Wikipedia. New to Wikipedia? See the contributing to Wikipedia page for everything you need to know to get started. To find other internal project pages of interest, see the department directory. Counter systemic bias by creating new articles on missing important female scientists. Other helpful tasks include, fixing vandalism, welcoming newcomers, link recovery, categorization, and numerous behind the scenes tasks like moving free images to Wikimedia Commons. See Wikipedia:Maintenance for more maintenance tasks. The primary purposes of new page patrolling are to identify articles which do not meet the criteria for inclusion and/or to tag them for any glaring issues that need attention. Most critical are copyright violations and defamatory material about living persons. This backlog lists tasks that should be done to improve Wikipedia (assuming the cleanup templates were placed correctly). Helping reduce backlogs is an important issue, so please feel free to help out. Click any linked number for that category's articles prioritized by their number of incoming links. There is currently a request for adminship open for discussion. Treat uncontested AfDs as uncontroversial deletions? Should the criteria for "recent deaths" listings on "In the news" be changed? Allow non-admins to close RfDs to "delete"? IP block exemptions to users in good standing? Project page—The goal of this project is to ensure that Wikipedia has a corresponding article for every article in every other encyclopedia. Sign in! Many other lists of politicians, songs, TV shows and others. On 1 November 2015, the English Wikipedia reached 5,000,000 articles. Free subscriptions to high-quality paywalled journals, newspaper archives, and online reference works are available for Wikipedia editors. For more information, see Wikipedia:TWL/Journals"
Also consider posting WikiProject, Task Force, and Collaboration news at the Signpost's WikiProject Report page. The Tip of The Day department is looking for tricks and techniques. If you have a special way of doing things, please stop by and share. Wikipedia:WikiProject Wales/Awaken the Dragon, a contest/editathon for April with substantial prize money for the most prolific editors is looking for contributors to contribute and produce Welsh-related content throughout April. It is supported by the National Library of Wales, which is hosting a physical editathon at the library on 22 April. Portal:Space The selected article excerpts were copied and pasted between 2006 and 2009. The leads of the corresponding articles have greatly improved since then. Portal:Thinking "Selected" sections need new material. Been the same for years. Portal:South East England A "parent" portal that uses selected content from several "child" portals, chosen at random for each type of content. Portal:Philosophy Automatically cycles through 52 "Selected philosophers", one per week, year after year. Portal:Arts Uses random generators to display random featured status selections. Here is a list of the main community pages of Wikipedia's sister projects. All of these projects are multilingual and open-content. Meta-Wiki – Coordination of all Wikimedia projects. Wiktionary – A collaborative multilingual dictionary. Wikinews – News stories written by readers. Wikibooks – A collection of collaborative non-fiction books. Wikiquote – A compendium of referenced quotations. Wikisource – A repository for free source texts. Wikispecies – A directory of species. Wikiversity – Where teachers learn, and learners teach. Wikivoyage – A world-wide travel guide. edited by humans and machines alike. Commons – Repository for free images and other media files. This page was last modified on 30 May 2016, at 15:41.